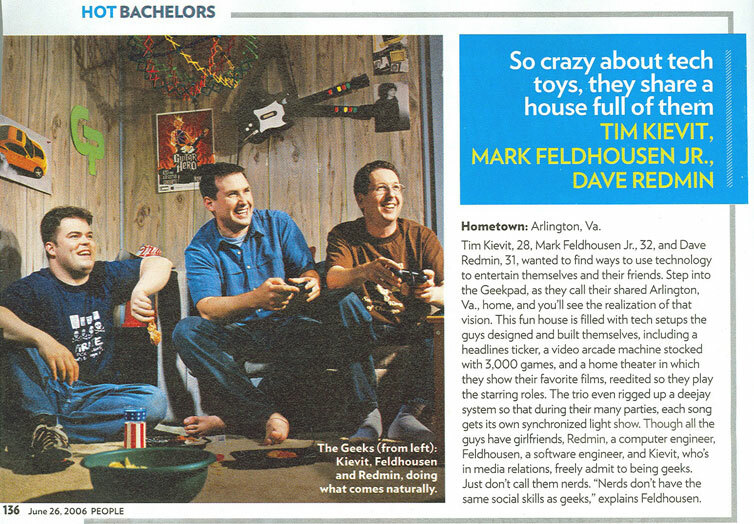 Ha, ok, not really, but we did manage to get ourselves into People magazine's "Hottest Bachelors" issue (June 26, 2006)! The Washington Post gossip column even got a little defensive (bottom of the page) about the whole thing (they later redeemed themselves). Then, Dave made an impromptu appearance on a local radio show, whose hosts proceeded to trash us relentlessly (fun to listen to while you look at the picture below). We love it all! Though we do wish that People would've mentioned the reason they discovered us in the first place. It was thanks to all the hard work that we (and a whole lot of our friends) put into a fun group called SMASHED. We've helped raise a bunch of money for local DC-area charities, with great events like the DC Idiotarod, the Rec Room Olympics and the Scavenger Hunt. Anyway, check us out in People- you can always find our 15-minutes of fame on page 136 (or just look below).